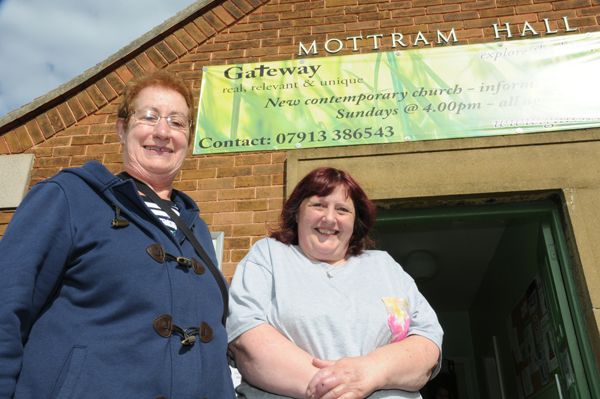 Gateway Food Bank Voluntary Co-ordinator Janet Crownshaw, with volunteer Linda. Tucked away on Mottram Street just behind Barnsley Interchange, is an unassuming brick building at the end of a row of old terrace houses, called Mottram Hall. It is the kind of place that you don’t really notice in passing. This is the home of the Gateway Church, where as welfare cuts began to bite, the first food bank in Barnsley town centre was opened in early 2013. Janet Crownshaw, a Gateway Church partner and voluntary co-ordinator explains, “after attending a conference in Barnsley on poverty in 2012, we realised a food bank needed to be organised as soon as possible, to help the people of Barnsley who were in crisis situations. Shocking figures supplied by the Trussell Trust show that food bank use has risen sharply since 2011, when 128,697 people were supplied with food parcels, rising to 913,138 in 2013-14 (1). Although the government claims that there is no evidence of a link between welfare reform and the increase in the use of food banks, 83% of food banks reported that benefits sanctions had resulted in more people being referred for emergency food (2). A report for Defra, which remains unpublished, confirms this (3). Last year, the Gateway Food Bank fed 2,013 people. So far this year 1,335 have received food parcels. Each food parcel provides three days of food, clients are allowed three vouchers per year and are referred by partner organisations to people who are assessed to be in a crisis situation, such as those who have fallen prey to job loss, homelessness, benefit cuts or are in a situation of emotional vulnerability. Volunteer Dawn in the store room. Gill helps to sort donations. 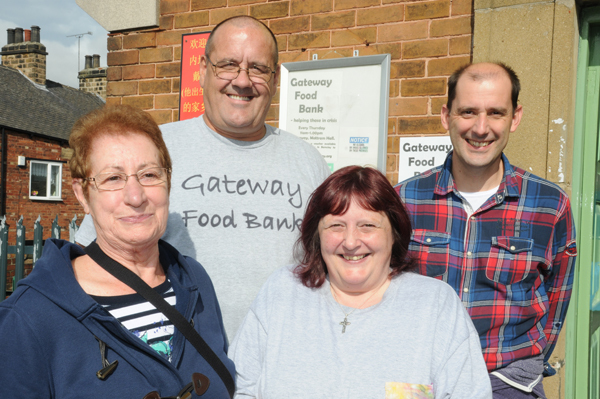 The Gateway Food Bank is an independent, community project and not part of the Trussell Trust. As with many community driven projects, funding is in short supply and donations are always welcome. “We never turn down any offer of help” said Janet. “We have received great help and support from local schools, colleges, supermarkets, hospitals, Berneslei Homes, local churches, charities and the people of Barnsley. Suggestions for donations are food items such as cereals, tea and coffee, powdered and long-life milk, sugar, biscuits, bottles sauces, tinned food such as fish, meat, beans, vegetables, tomatoes, pasta and fruit, desserts and dried packed foods. 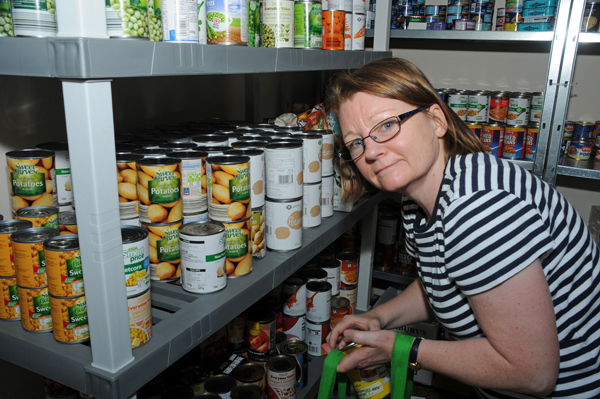 The food bank has its own bank account too, so donations of money can also be given to not only help to replenish food stocks, but also help to buy vital equipment such as shelving. Donations can be taken to the food bank on Sundays after 3.30pm or on Thursdays between 11.00am and 1.00pm. More information can be found at the Gateway Food Bank website here. Janet, Dave, Linda and Pastor Mark Reasbeck.